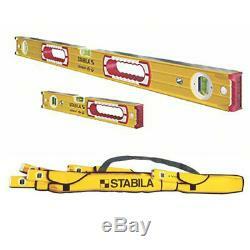 Stabila 37816 Heavy Duty 48-Inch & 16-Inch Type 196 Aluminum Box Beam Level Set. Brand New in Original Packaging. Stabila 30015 5-Pocket Case For 48, " 32, " 24, " and 16" Torpedo Level. The STABILA 48-Inch/32-Inch/24-Inch Level Carrying Case holds your levels so you can protect them from the elements. It can accommodate any Stabila level, from torpedo size all the way up to 48 inches long. The 48-inch level cases high-quality polyester construction provides toughness to take whatever harsh conditions that come your way. This case is bright yellow for high visibility. A carrying strap lets you sling the Stabila level case over your shoulder and use your hands for balance or to carry more tools with you. It includes multiple pockets so you can carry around levels of various sizes, which allows you to work easily on both large and small surfaces. Since its made from fabric, the case folds or rolls up for easy storage when youre not using it. Multi level pocketed except 96. Case has 5 pockets that can accommodate levels in a wide variety of sizes, including: 48", 32", 24", 16" and 10 Torpedo level. Strong, padded liner protects levels in transit. Convenient shoulder strap for easy carrying. Heavy duty, large tooth zipper. Tough high strength nylon outer shell. The Stabila 48-Inch/16-Inch Model-196 Level Set lets you take readings in virtually any part of the jobsite. The levels each have three vials, two vertical for finding plumb and one horizontal for determining level. These aluminum levels have a rigid frame that's reinforced with a ribbed design for exceptional durability. The 16-inch level has one hand grip, and the 48-inch level has two hand grips that let you use them in comfort and with minimal strain. The heavy-duty level features rubber end caps to prevent damage from being dropped or from impacts. You can remove the caps when you need to take flush measurements or keep them on to protect drywall surfaces from gouges. Accuracy certified professional grade tools. Clear vials with spring steel hairline indicators. Light, strong, wide aluminum frame. In the Continental US Lower 48 states only. We cannot declare items at a lesser value or as gifts. F There are product categories which are not returnable due to hygienic or sanitary as required by manufacturers. In an event where there is an error regarding a price error or description, we will notify you ASAP. Items removed from their'blister-pack' display packaging are non-refundable. The item "Stabila 37816 48-Inch & 16-Inch Aluminum Box Beam Level Set with 5-Pocket Case" is in sale since Tuesday, July 31, 2018. This item is in the category "Home & Garden\Tools & Workshop Equipment\Measuring & Layout Tools\Levels". The seller is "asavings" and is located in Brooklyn, New York. This item can be shipped to United States.